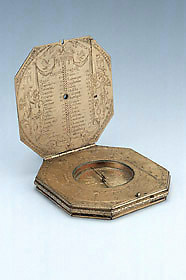 A finely engraved and proportioned compendium incorporating a nocturnal, universal equinoctial sundial and compass, as well as sights, circle and shadow square. The presence of a coat of arms suggests that the instrument was commissioned by a gentleman or nobleman. Philippe Danfrie was France's pre-eminent mathematical instrument maker in the second half of the 16th century.